While not everyone is addicted to the consumption of table tennis news, the webmaster would like to offer appreciation to all who stop by here and take the time to read the latest developments at St Andrews Table Tennis Club. On the occasion of the 100th post, it is appropriate to offer thanks to all who contribute photos, videos, text and news to the blog. We await with eager anticipation the arrival of the 10,000th visitor to the site over the next few days. This entry was posted in St Andrews Table Tennis Club on September 25, 2015 by standrewstt. 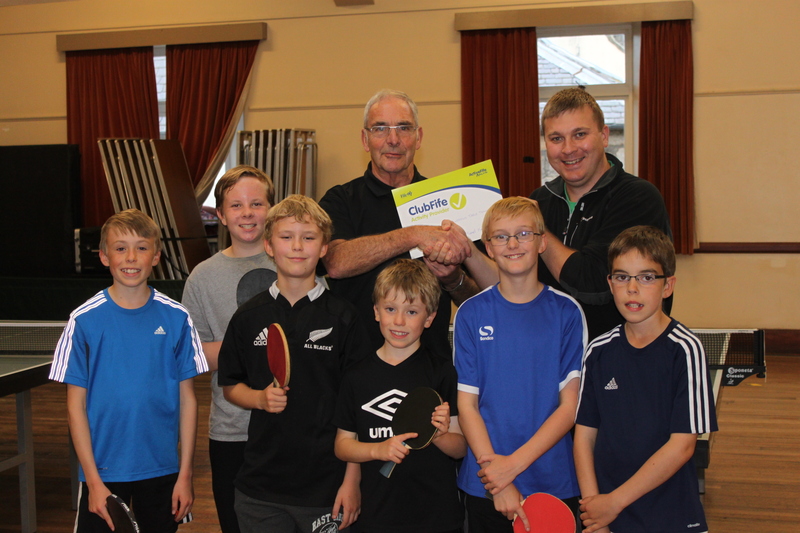 St Andrews Table Tennis Club was recently awarded ClubFife Activity Provider accreditation by Fife Council. The accreditation is awarded to clubs that demonstrate the required standards of coaching, governance, first aid and child protection. The photo shows club Chairman, Neil Lea receiving the ClubFife award from Sports Development Officer, Michael Kavanagh, alongside the club’s current youth development squad. St Andrews Table Tennis has had good weeks and bad weeks. This week (play starting Monday, September 15), the inaugural week of play of the 2015/2016 season, certainly could have gone better. First the good news: the Prospects, in their line-up with David Goddard, Sandy Pearson, and Fabio Sani, managed a very respectable 5-5 score against Villa, a strong team headed up by David Hunter. This was a particularly good night for Sandy with victories over both David Hunter and Deepak Gopinath who were much more highly ranked than him last season. Indeed Villa needed Craig Fraser’s 3-0 performance to hold the draw. The match was tense throughout and a highlight was Dave G’s phenomenal holding out for victory at the end of the night against David Hunter, enabling the Prospects to start the season on the 5-5 mark. Also, accolades go to Fabio Sani, who is returning to league play after a couple of years away, and played well (winning one match), but with perhaps just a bit of rust. And in Division 1, we still must wait a couple of more weeks before our Prefects face league action. Next up will see Prospects at home versus Kingsway. When league play is tough, we can still take comfort in the social side of our club. This season, like last year, we are running various coaching sessions and holding many informal hits. In particular, we would like to highlight Elaine Forbes’ Adult Beginners/Returners Group Sessions starting on Thursday 24th September at Madras College, Kilrymont Road. These offer valuable lessons from Scottish 6-time champion, the mighty Elaine Forbes! Players can turn up any time from 6 pm until 7.30 pm, cost £3.50 per week. After this, usually club members arrive for general practice in the hall at Kilrymont, going until 9-9.30pm (payment at the front entrance). We look forward to seeing you there! This entry was posted in St Andrews Table Tennis Club on September 18, 2015 by standrewstt. This entry was posted in Match reports, St Andrews Table Tennis Club on September 14, 2015 by standrewstt. This Monday, the 14th of September, will see the kick-off league matches for the 2015-2016 season, with Prospects taking on Villa in Division 3, and Swots taking on Telstars in the second division, both on home ground (Victory Memorial Hall) from 6:45pm. On Thursday, New Kids will be away for their Division 2 fixture versus Rockets, while Prefects have a few more weeks of leisure before needing to be ship-shape to face their new Division 1 challenges. Indeed, after a summer of lying about, resting on their laurels from last year’s triumphant season, the club members now need to show they can do more than bend elbows and ears at the Whey Pat inn. We wonder, can any of them still even hold a table tennis bat? Watch the video reflections of four club members as they contemplate the new season. 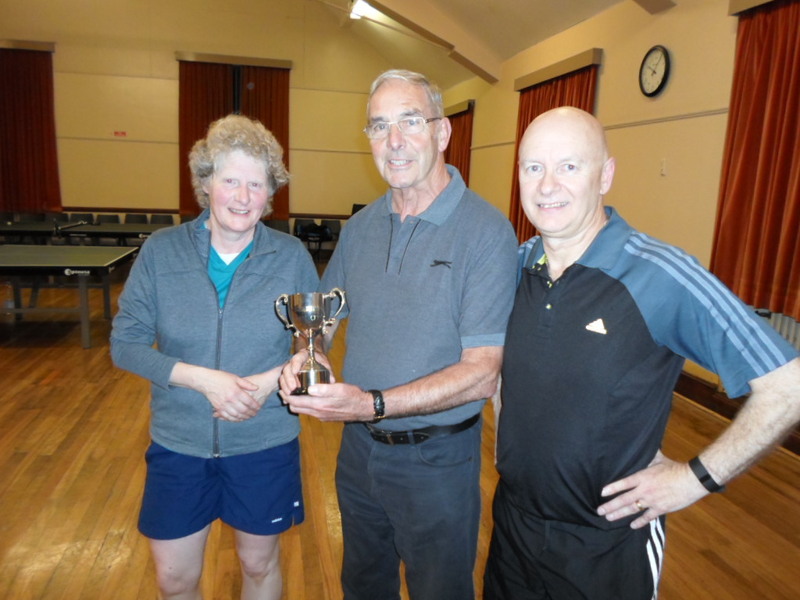 Elaine Forbes and Dave Beveridge, winners of the Eglinton Cup in 2015 are presented with the trophy by club chairman Neil Lea. To help shake off the rust, the club recently held its famous Eglinton Cup tournament. It was established in 2006 in memory of the fine David Eglinton, who played in the St Andrews TT club from the late 1960’s through the 1980’s, reaching Division 1 in 1982. This year the handsome trophy will be engraved with the brave new winners’ names: Elaine Forbes and David Beveridge. And, while we expect that Elaine will take this further accolade to her phenomenal career with grace and dignity, we are sure we will see the exact opposite from “Flash’’ Dave Beveridge. Also, for those not privy to the mysterious inner workings of the Dundee and District Table Tennis League, we mention there have been a few changes to our teams this season. To be fair, this represents both league and club reactions to the stunning triumphs of the previous year, the intake of new folk, and the departure of regular players. Team members are listed on the home page. So, send flowers, throw money, or otherwise, join us, to celebrate another fine adventure; another frolic with the wooden (and carbon fibre) bats, our larger plastic balls, and slate tables, another season with the St Andrews TT club! This entry was posted in Uncategorized on September 10, 2015 by standrewstt.